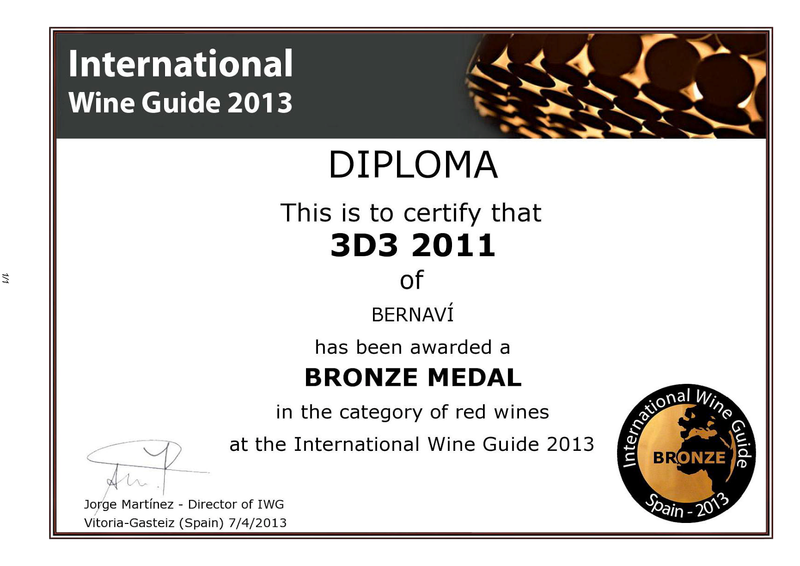 BERNAVÍ eng: 3 awards of 3 !!! 3 awards of 3 !!! Last night we new another fantastic thing: the results of the competition "International Wine Guide 2013" was published, and we made hat-trick. Of three wines presented, recognized three medals! 2425 wines from 29 different Countries were presented at the competition and finally 728 were rewarded: from Great Gold to Bronze. The level of the wines presented is really important and BERNAVÍ obtained really great results. For the first time we presented to a competition our NOTTE BIANCA and we do it with the second vintage, 2012: SILVER MEDAL, one of the 293! And also what initially seemed to be a young red as the 3D3 2011, its first vintage, continues to surprise (CWWSC2013): BRONZE MEDAL a few weeks before bottling 2012 one. Awarded Bronze medals were just 275. With these results also in the international arena I think I can say that BERNAVÍ started on the right way and that the result of good work is recognized.